If you are a seasoned golfer or have been playing for a while now, the chances are that you have used a Callaway product at some point as they are one of the leading golf equipment manufacturers. Callaway makes everything from golf clubs to golf bags, and they always seem to know what golfers are looking for. The company has been in business for over three decades now, and in recent years they have emerged as one of the leading golf rangefinder manufacturers. Callaway now prides in having some of the bestselling and most popular golf rangefinder models in the market, and their devices are used by all kinds of golfers from beginners to pros playing on the tours. The compact and lightweight design and ease of use that are characteristic of Callaway devices are some of the key elements that make them popular. Also, the brand makes use of some impressive technologies in their rangefinders to enhance their performance, convenience, and reliability. Some of their most amazing features include Pin Acquisition Technology, Scan Functionality, 6X Magnification, and the unique Birdie feature that alerts you when you are locked on to the pin. High Accuracy: Callaway makes some of the most accurate golf rangefinders to ensure that you always get reliable measurements. A typical Callaway rangefinder will provide an accuracy of at least +/-1 yard for most distances. Relatively Affordable: When compared to models from other top brands, most of Callaway rangefinders are relatively affordable. You can get a good rangefinder from them for slightly over $100 and with similar features and capabilities to others from other brands that cost double. Long Battery Life: Provided you buy a genuine Callaway rangefinder, you can be confident of a long battery life. Even their cheapest models will have batteries that will last for at least a couple of golf rounds. Compact and Lightweight: Because the company understands that golfers hate carrying heavy gadgets for several rounds of golf, they make all their rangefinder models ultra-compact and lightweight. GPS Connectivity Issues: One of the most common complaints from golfers that use Callaway rangefinder is the GPS connectivity having issues. Some golfers complain that the GPS takes a long time to connect to the satellite which can be annoying. Relatively Smaller Display: When compared to what you get from top models from the leading brands, Callaway rangefinders will have relatively smaller displays. But, the LCD screens on these gadgets still make it easy to read the measurements, and so this is often not a deal breaker. A high performing golf rangefinder that gives you the best of two worlds as it has both GPS and laser technologies. Also, this top quality rangefinder has Pin Acquisition Technology that will be highly useful when you want to lock onto the flag fast. And with a range of 5 to 1,000 yards, you can use it to measure almost any distance on the course. Other features like auto course recognition, auto hole advancement, 30,000+ preloaded courses, 6X magnification, clear and easy to read LCD screen and the amazing Birdie feature that alerts you when locked on to the flag also help to make this a great golf rangefinder. 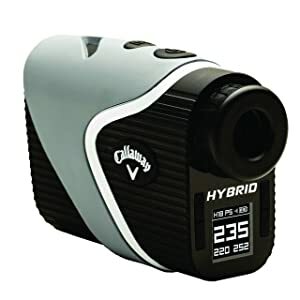 2-in-1 Rangefinder: Perhaps the most impressive feature of the Callaway Hybrid, and it combines two technologies in a single unit. And so with this rangefinder, you get both laser and GPS technology for increased versatility and more reliable measurements. Pin Acquisition Tech: When you want to lock onto the flag fast the P.A.T will come in handy as it is designed to lock onto the pin with an accuracy of +/-1 when you are at least 300 yards away. And it will be useful even when there are trees and any other objects behind the pin. Range and Accuracy: This is a long-range golf rangefinder with a range of 5 to 1,000 yards, and it maintains a superior accuracy of +/-1 regardless of the distance. 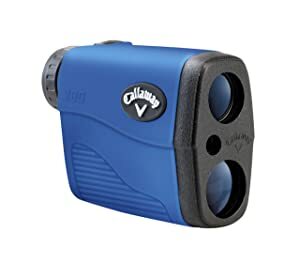 Distances Measured: With this rangefinder, you can measure distances to the front, back and center of the green and also other things like the carry and layup distances to the doglegs and hazards. BIRDIE: Another unique feature of this hybrid rangefinder and it will give you some assurances that you have locked on to the pin by making an audible chirp. Battery: This golf rangefinder is equipped with two batteries. One is a rechargeable lithium battery that will last up to two rounds of golf and the other is a 3V battery for the laser which means that the laser will still function even when the GPS battery drains out. 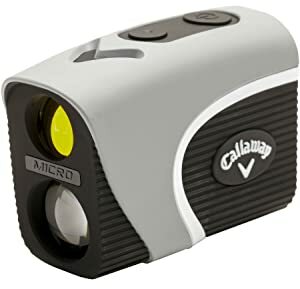 Callaway 200 is one of the most affordable laser rangefinders by Callaway. But, despite its affordable price tag, it is still a feature-rich gadget with Pin Acquisition Technology that makes it easy for golfers to lock onto the flag and do it fast to speed up play. This top quality rangefinder has a range of 5-800 yards and maintains an accuracy of +/-1 yard. The simple to read LCD screen also ensures that you can easily read the measurements in any light condition. Also, the rangefinder features 6X Magnification, weatherproof construction, Scan functionality and comes in an ultra compact and lightweight design to make it easy to carry around. Pin Acquisition Tech: P.A.T will allow you to pick up and lock on to the flag fast from distances of up to 275 yards and with an accuracy of +/-1 yard and this will help to speed up play. LCD Screen: Besides providing quick and accurate measurements, reading them is also made easy by the clear and simple to read LCD screen that will also display in both meters and yards. 6X Magnification: The 6X Magnification that you get with this rangefinder is one of the highest in its class, and it is meant to allow for easy pin targeting and landscape scanning when you want to acquire multiple objects. Range and Accuracy: With a range of 5-800 yards, this golf rangefinder will work for any golfers and in any course, but the best thing about it is that it will maintain an accuracy of +/-1 yard from any distance. 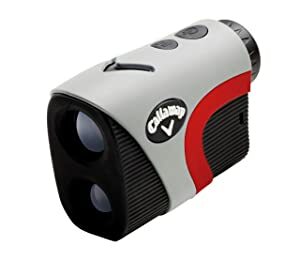 Weatherproof Construction: Callaway makes their model 200 laser rangefinder for use in any weather, and they do this by making it both fog and waterproof. And so you can focus on your game when using it in any weather with no worries. The slope function is one of the key highlights of the Callaway 300 Pro, and it will not only measure the incline or decline angle but also calculate distances adjusted for the slope automatically. And you can easily turn off this function to make your rangefinder legal for use in tournaments. This rangefinder also offers 6X magnification, Birdie feature to let you know when locked on to the flag, scan functionality, Pin Acquisition Technology and a range of 5-1,000 yards with an accuracy of +/-1 yard. Slope Function: The slope function ensures that you get distances that compensate for the incline or decline together with the distances to the pin. And you can turn off the function easily to make this a tournament legal rangefinder. 6X Magnification: With this high-quality magnification you will get easy pin targeting and also simple landscape scanning when you want to acquire multiple targets which can be very useful for a golfer. BIRDIE: A unique feature in many Callaway laser rangefinders, and it will deliver an audible chirp to help confirm that the rangefinder has acquired the distance to the flagstick and not anything else around it. Pin Acquisition Function: Allows golfers to lock onto the pin quickly and accurately from up to 300 yards away. Range: Long range device that will measure 5-1,000 yards while maintaining a superior accuracy of +/-1 yard. With both laser and prism technologies integrated into this compact and lightweight golf rangefinder, you can be confident that it will be highly useful for you when on the course. For the prism technology, acquiring the distances to flagstick with built-in reflectors will be a super fast and accurate process. Like many of their other top quality rangefinders, Callaway also uses the P.A.T technology on this model to make it easy and accurate to lock onto the flag. This rangefinder has 5-600 yard range with +/-1 yard accuracy, simple to read LCD screen, Scan functionality, long-lasting battery, and a weatherproof construction. Prism Tech: This rangefinder will include both prism and laser technologies. The prism technology will come in handy for flagsticks that have the built-in reflectors as it will let you acquire distances to the flag with little effort and high accuracy. P.A.T: Always a fantastic feature to have in your Callaway golf rangefinder, and it is designed to allow you to lock onto the flag super fast and accurately. LCD Screen: With this rangefinder, the distances will be conveniently displayed on the bright and large enough LCD screen that will ensure you do not strain to view the information. Scan Functionality: Like most other Callaway rangefinders, this one also has a scanning functionality that will allow you to acquire distances to multiple objects on the course fast by scanning the landscape. Range and Accuracy: This is a 5-600 yard range device which is often more than enough for most golfers, and it will provide an accuracy of +/-1 yard. There is no doubt that Callaway is one of the most reputable golf equipment manufacturers, and they make almost anything golf-related that you can think of or might need when playing the beautiful sport. However, when it comes to rangefinders, they seem to have an edge over most other brands with their impressive technologies and well-built gadgets. Hence, if you are on the market for a high-performing, well-built, feature-rich and weatherproof golf rangefinder, Callaway is one of the best brands to buy. Also, they have several models in different price ranges and with different features to suit all kinds of golfers, and so you can always be sure that Callaway has something that will work for you.